As Believers in Christ we have received every spiritual blessing, that means we have been given all we will ever need to succeed in this life. These blessings of God should outweigh any difficulties of the present time,and they should remind us that we are loved, provided for, and protected in the present as well as in the future. As we consider God’s gift of salvation, His many promises to us, all the spiritual blessings received in Christ,and the promise of Jesus return and His coming Kingdom, we should be brought into a constant state of joy, no matter what our current situation might be. Dear God, As Your child, who has believed and received Your Son, Jesus, as my Savior and Lord, I come before You now in prayer to claim all of the promises and spiritual blessings that You have for me in the heavenly places. Father, what You have purposed in Heaven for me, I ask You, in the name of Jesus, to bring to earth for me so that I might walk in Your blessings and promises daily. May You bless me and protect me. May You smile on me and be gracious to me May You show me Your favor and give me Your peace. 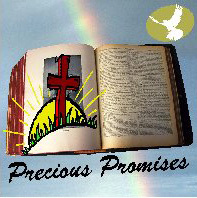 For nothing in this world can compare to Your promises and the blessings given by You. “54 Spiritual Blessings in Christ” Devotional with optional Journaling pages is a wonderful resource for learning just what those Spiritual Blessings are that believers have received in Christ. 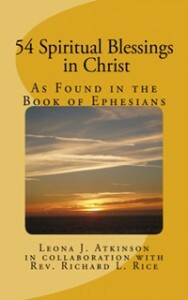 This book lists 54 Spiritual Blessings that are found in the book of Ephesians, Chapters 1 through 3. It lists each Blessing with supporting scriptures and a short descriptive message with a walk it out prayer, plus it offers journaling pages for those who would like to write their own thoughts or prayers daily. As God’s children we should be aware of all the blessings we have received from Him so we can learn how to use them in our lives daily. Not only will they strengthen and uplift us, but they will also reflect His glory to others as we walk in them daily.